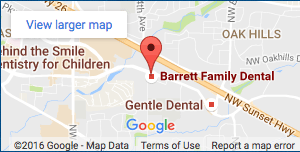 At Barrett Family Dental, we strive to provide access to care for all patients. Research has shown that oral diseases such as tooth decay, gum disease and a wide variety of soft tissue conditions impact the whole body. Because of this, it is critical to maintain a healthy mouth as part of a healthy lifestyle. Did you know that tooth decay is the most common preventable disease in the United States? Did you know that active gum disease has been shown to have a negative impact on a variety of systemic conditions such as diabetes and heart disease? Did you know that 1 person dies every hour in the United States from oral cancer and it’s becoming more common? The simple truth is the mouth is part of the body. In the past, the medical community has not viewed it in this way. Research over the last decade has proven that health problems in the mouth wreak havoc in the rest of the body. The longer these conditions are allowed to go unnoticed and untreated, the worse they become. It is imperative to have regular dental checkups to prevent the onset of these oral diseases. Sadly, lack of dental insurance has proven to be a limiting factor for many patients. People in need of care go without it simply because they do not have insurance coverage. Many of these people have easily treatable dental disease and it is worsening because they lack an affordable access to care. Often, they will wait until they are in pain to be seen and by that time treatment is either very expensive or teeth are not savable. The consequences of doing so can have a very dire impact on quality of life. As a leading dentist in Beaverton, Dr. Barrett believes a plan like this will allow many more patients receive affordable preventative dental care. As a result, we will be able to detect problems that occur early when the treatment is simple and cost effective. When problems such as the need for fillings, crowns or treatment of active gum disease arise; our Dental Savings Plan will help our members by providing a 10% reduction in those costs. It is our belief that this will help our community achieve a healthier living. Adult patients can take advantage of this plan for $299 per year and for children ages 12 and under the cost is $149. Contact us today for details or questions.